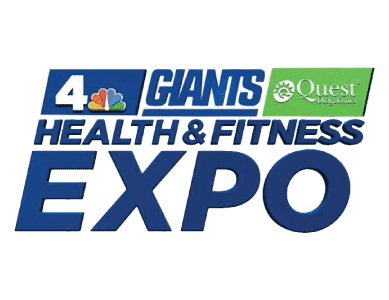 EAST RUTHERFORD, N.J. (July 9, 2014) – Fun, free and family-friendly, NBC 4 New York and the New York Giants are teaming up to host the second annual Health & Fitness Expo presented by Quest Diagnostics, a Proud Partner in Health of the New York Giants. Families in the tri-state area are invited to MetLife Stadium on Saturday, July 19 and Sunday, July 20 from 10:00 a.m. – 3:00 p.m. for a full weekend of fitness activities, health screenings and much more. Quest Diagnostics will provide visitors ages 18 or older with complimentary health screenings for levels of vitamin D, cholesterol (to assess heart disease risk), hemoglobin A1c (to assess diabetes risk) and other wellness tests run by its trained medical staff. Quest will also provide information about the MyQuest by Care360 mobile health app and online health management system, which helps people track their lab test results. In addition, fans can test their athletic ability at the Quest Test Agility Station where they will compete in NFL Combine athletic drills. Quest Diagnostics is the world’s leading provider of diagnostic information services. Hospital for Special Surgery is hosting the “Giants Experience” exhibit on the field inside MetLife Stadium, offering visitors the opportunity to catch a pass in the end zone and attempt a field goal. They are also sponsoring New Jersey PGA’s and New Jersey Golf Foundations’ Family Fun Zone, providing professional instruction for all ages and skill levels. Avon Walk for Breast Cancer is providing visitors the opportunity to try out a new fitness activity by sponsoring the Zumba Zone which will hold many classes throughout the weekend. They will also be holding open registrations to walk with the New York Live team at this year’s Avon Walk for Breast Cancer in October. Bob’s Discount Furniture will hold a blood drive in partnership with the New York Giants and the American Red Cross on Saturday from 10a.m. – 4p.m. All presenting donors will get the chance to meet a Giants legend and receive a special personal photo! The first thousand blood donors will receive a limited edition Giants t-shirt. Hackensack University Medical Center will have physicians on hand at their “Ask the Doc” health pavilion, focusing on men’s health. Marvel Universe Live! will provide information about their live-action arena shows and give kids the chance to throw Thor’s “Mjolnir” hammer at bad guys, try on Hulk “hands” to smash through a brick wall, aim Hawkeye’s bow and arrow at targets, practice punches and kicks like Black Widow and fling Captain America’s shield. MetLife will be on-site with their beloved mascot Snoopy to meet and greet attendees. Dunkin’ Donuts will distribute information about their DD Perks Program as well as hand out iced green tea samples for visitors to try. Walgreens & Duane Reade will host the “Journey Through the Heart” exhibit. They will also be sponsoring the second annual New York Giants Run of Champions 5K Race on Sunday morning at 9:00am. To register, visit www.nyrr.org/giants. Stop & Shop will be handing out healthy produce to sample. LUNGevity will be on-site distributing materials that will help to bring further awareness to lung cancer and those suffering from the disease. Visit Florida is sponsoring the “Be a Diver” Scuba Tour, giving visitors the chance to try out the latest scuba diving equipment for free. Massage Envy Spa will have free chair massages in addition to distributing information detailing their services. Pearle Vision will provide visitors with free vision screenings as well as details about how to sign up for a future eye exam at their local Pearl Vision. Visitors can also participate in a game for the chance to win a free pair of sunglasses. Toufayan Bakeries will be passing out samples of their Smart Pockets Pita Bread, Toufayan Natural Pita Chips, and Toufayan Goodie Girl Gluten Free Cookies to give visitors a taste of their product. Aquafina will provide bottled water forthe event. With over 100 exhibitors and nonprofit organizations in attendance at the NBC 4 New York and Giants Health & Fitness Expo, visitors will be able to talk to representatives and obtain information from booths hosted by Autism Speaks, American Red Cross, American Diabetes Association, Bergen County Department of Health Services, Bergen County Police, Body Sculpt of New York, Community Food Bank of NJ, Disability Rights New Jersey, HearStrong Foundation, National Kidney Foundation, New York Road Runners, Pancreatic Cancer Network, Urban League of Hudson County, Veteran’s Crisis Line and many more. The NBC 4 New York and Giants Health & Fitness Expo will also offer an extensive lineup of events and activities at numerous health pavilions located throughout MetLife Stadium, ranging from tests and screenings to healthy eating demonstrations and fitness activities. Visitors will also have the opportunity to walk on the field, tour the Giants locker rooms and meet their favorite Giants players as well as NBC 4 New York and Telemundo 47 reporters. In addition, Bergen County will be presenting many informational booths and hosting several demonstrations to educate the local community. The Bergen County Animal Shelter will host a pet adoption center with veterinarians on hand to answer any pet related questions from microchipping to pet safety. The Office of Alcohol and Drug Dependency will have “GIZMO” the robot to talk to kids about “keeping the machine clean” and staying away from drugs. The Mental Health Division will provide information on available resources, especially for teens and veterans. The Environmental Health division will hold educational sessions throughout the day on litter, clean water, and keeping the community clean. The Law and Public Safety Institute Division of Fire Training will educate kids about fire safety in the home, including a sprinkler demonstration and a drill demonstrating how to evacuate a home safely during a fire. The Bergen County Police will have a K-9 Demonstration and the Office of the Sheriff will conduct tours of Bureau of Criminal Investigation Truck. The East Rutherford Police Department will also be in attendance, presenting a Drunk Driving Awareness Course including a DWI simulation area. The Port Authority bus service will provide transportation to and from the event. The 351 Bus Service will run hourly on Saturday, July 19 and Sunday, July 20 from 9:00AM to 4:00 PM. The buses will go from Port Authority Bus terminal to MetLife Stadium Lot K, and will be located in Gates 305 and 306. For more information, visit: www.351express.com. In addition, New Jersey Transit will operate a bus service from Secaucus to MetLife Stadium on Saturday, July 19 and Sunday, July 20 from 9:00AM to 4:00 PM. Standard fares apply. The NBC 4 New York and New York Giants Health & Fitness Expo is produced and managed by Network Events, Inc. Network Events, Inc. is an event development and management firm specializing in the production of consumer wellness events in conjunction with media partners www.networkevents.tv. For more information on the NBC 4 New York and Giants Health & Fitness Expo, please visit www.nbcnewyork.com/expo or www.giants.com. Updates about the Expo will also be available on Facebook https://www.facebook.com/NBCNewYork and on Twitter at #NBC4NY.